Let’s learn the most common terminal commands that every Linux/OS X user should know. In this tutorial, we’ve drilled down some of the most important commands that are useful for beginners and essential for DevOps engineers and Sysadmins. With these terminal commands, one can easily do tasks like monitor system info, disk usage, file management, process management, configure/view network settings and a lot of other things. If you’re working as a DevOps or SysAdmin or a C/C++ programmer on Linux, then these commands could even be more useful in automating a lot of your tasks. We’ve segregated them in five core areas. Please check from the table given below. For those preparing for interviews should also go through the below Linux quiz to assess the level of their preparations. ☛ Recommended – 30 Linux Questions With Answers – Online Test. Here is the table of content for quickly browsing through the terminal commands. 1. Commands To Check System Memory. 2. Commands To Check Disk/File Usage. 3. Commands To Check on Running Processes. 4. Commands To Monitor & Manage Network. 5. Commands To Configure Terminal & Screen. 6. Miscellaneous Commands for Quick Reference. 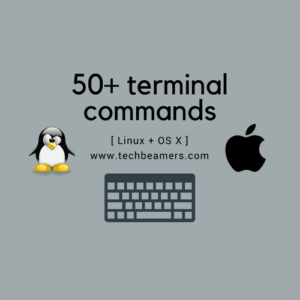 50+ Terminal Commands – Linux/OS X Users. 1. Terminal Commands To Check System Memory. It’s the most frequently used command to track memory usage on Linux. The “-m” option returns the usage data in MB format. Another way to quickly check the memory consumption is by printing the command. You need root or access to run this command. It reverts with the memory usage in the same way as the command does. But you need not be a root user to run this command. If you are in a situation, where the memory usage is between 90-100%. Then, you should use top command to determine the process responsible. Most of the time, you can verify the process consuming resources by looking at the <%CPU> or the <%MEM> columns in the top output. It also allows sorting on the columns. Press (Shift+O) to select a column via field letter. For example, press “a” letter to sort process with PID (Process ID). It’s an extension to the top command. And it provides several other options and details along with displaying the memory usage. The top header in its output shows the CPU usage, RAM and swap statistics. Running HTOP Command in Terminal. 1.6. Additional Linux commands to isolate memory issues. 1. Print the top 10 processes consuming a lot of memory. 2. Kill a process while running the top command. Run top and press “k”. It’ll prompt you for the process ID and ask for the signal to kill. You can enter the PID of your choice and provide 15 as the signal value. Using Top Command to Kill a Process. 3. Modify top command to print the absolute path in its output. After running top, press “c” to display the processes with full path and arguments. 4. Sort “ps” output by memory usage, from high to low. 2. Terminal Commands To Check Disk/File Usage. It’s one of the standard Linux commands to retrieve the disk usage of files and folders. 1. If you wish to check the disk usage of a folder and its subfolder, then run the following command. It displays the output in the form of disk blocks. To print in bytes, kilo bytes, mega or Gigabytes, use the “-h” option with du command. 2. To check the total space occupied by a directory, use the “-s” option with the du command. 3. Using “-c” switch will get the total size of the directory including the subdirectories printed at the last line. There is also an “-a” flag to display the usage of all files and folders. 4. With the “–exclude” switch, you can specify a file pattern. Then, the du command will filter the files matching the given pattern. 5. Locate the biggest files in the current directory and sub-directories. 6. Look out for the largest directories. Another Linux command to monitor disk space is df (disk free). Now, let’s see what can we do with it. 1. Print the disk usage of all the file systems. 2. Use a fixed memory block size. By default, it prints memory blocks of 1K. But with the “-B” option, we can alter the default memory size. 3. Style output to human readable format. Use “-h” option, it makes the display memory in the form of gigabytes, megabytes, etc. 4. Check the type of available file systems. You can run the df command with “-T” option to show the type of all file systems. You can even exclude a file system with -x option. Or provide a type with -t option, it’ll result in displaying the same kind of file systems. 2.3. Additional Terminal Commands for File Management. There are some other useful tips that you can use to optimizing your disk management tasks. 1. Delete files marked for deletion but not yet deleted. 2. Search for files more than 100 MB. 3. Check files created within the last one week. 4. Remove files older than two weeks. 5. Monitor a log file for errors or some text. $ tail -f file.log | grep -i "error"
3. Terminal Commands To Check on Running Processes. It’s one of the most used Linux commands which returns a preview of the running processes along with their PID, CPU/RAM usage, and other details. 1. Check the Shell you are using. 2. Check the processes not owned by you. grep -v option inverts the selection. 3. Remove grep command while filtering the process list. 4. Display all process including params and hierarchy. 5. List the files opened by a process. 6. Print the process running time since it started. 7. Check all threads of a running process. Use case – When you’ve to stop a process behaving intermittently and which refuses to close itself. So the kill command comes for rescue in such conditions. Its syntax is as follows. 1. Terminate a process by ID. The “-9” flag refers to KILL signal. Some of the other signals are HUP (-1), SIGINT (-2) and TERM (15). Another Linux command which kills a process by name is as follows. You can even kill multiple processes using the single command. It is one of the Linux commands which allows watching a process execution. It intercepts the system calls and signals that a program exercises while running. 1. Trace a program using its PID. 2. Monitor a process for any specific system call. Sometimes, we need to monitor a process at regular intervals. For example, tracking the progress of copying a large release build or folder. That’s where the watch command is useful. 1. Run ls command after every 1 second. 2. See the differences between previous and present output. You can anytime press CTRL+z to take control back from the watch command. 4. Terminal Commands To Monitor & Manage Network. 4.1. The IFCONFIG and related commands. The most common usage of command is to return the IP address of the system you are using. But you can also use it to initialize an interface, assign a new IP address and enable/disable the interface. 1. The below command will print the IP address of the current machine. 2. To print the information related to a particular interface, run the following. 3. Assign IP address and set gateway. 4.2. Some nice ping command examples. It’s basically to find out whether a machine on the network or the gateway is reachable. Here are some good examples. 1. Increase/decrease ping time interval. 2. Check if local I/F is active. 3. Update the size of the ping packet. The above command changes the default packet size from 56 to 112. 4. Timeout a ping request. 5. Send X no. of packets and stop. It’s for troubleshooting the network issues. It prints the no. of hops taken to reach the target. This command allows a user to monitor both incoming and outgoing network connections. Most of the operating systems support this command. Let’s see some of its real-time applications. 1. Listing all TCP and UDP connections opened at a time. 2. List connections without resolving host, port and user name. 3. Listing only TCP connections. 4. Listing only UDP connections. 5. Display TCP connections in Listen state. 6. Display UDP connections in Listen state. 7. Display service names with PID. 8. Print routing table summary. 9. Retrieve IP address statistics. 10. Locate all programs in Listen state. 11. Find the port of a program is using. 12. Show all ports listening with process PID. The full form of DIG command is domain information groper. It retrieves the DNS details like A record, CNAME, and MX records. 1. Display only MX Records. ubuntu.com. 2845 IN MX 10 mx.canonical.com. 2. Display only NS Records. ubuntu.com. 1328 IN NS ns3.p27.dynect.net. ubuntu.com. 1328 IN NS ns2.p27.dynect.net. ubuntu.com. 1328 IN NS ns4.p27.dynect.net. ubuntu.com. 1328 IN NS ns1.p27.dynect.net. 4.6. Miscellaneous network Linux commands. 1. Display all TCP sockets in use. 2. Resolve IP address from the hostname. 3. MTR – Top like traceroute command. It combines the functionality of traceroute and ping tools. It examines the connectivity between the host and the given target system. 5. Linux Commands To Configure Terminal & Screen. It might now be available on your system by default. So, to install it either use apt or yum as per the distribution you are using. 1. Start a screen session as the current user. 2. Reattach to a screen session. 3. Record a terminal session. 4. Play back a recorded terminal session. 5.2. Some Useful Terminal Command Shortcuts. 1. Open a new terminal. 2. Open a new tab in the existing terminal window. Press CTRL+l or type clear and enter. 6. Some Important Terminal Commands for Quick Reference. 1. How to run a previous command as root? 2. How to find differences between two directories? 3. How to lock a directory. The root user will still have access. To restore the permission, run the below command. #To change to last working directory. #To return to your home directory. 5. How to replace same text in multiple files. To replace the text Apple with Linux in all text files in current directory and down you can run this. 6. Listing files changed today. Sometimes, we create a file during the day and forget what name we gave it. So here is the command to locate such files. Not all of us has the ability to memorize the long Linux commands. With the below command, we can assign user-friendly names in such cases. 8. Copy a file into multiple directories. 9. Disable incoming ping requests. To block a flood of incoming pings, do the following. To turn the above setting back, run the below command. 10. Some cool Nautilus tricks. Press CTRL+l to open a location. Use CTRL+up to open the parent directory. Press arrow keys to navigate through folders. ☛ Also Attempt – Unix Shell Scripting Quiz Featured With 25 Best Questions. If you liked our explanation on the top terminal commands on Linux and Mac OS X, then do share it with others. Also, follow us on our social media (facebook/twitter) accounts.